Alex Salmond has today claimed that an independent Scotland's (iScotland) EU membership terms could "be finalised in 18 months" i.e by March 2016. There is an obvious political reason for wishing to play down the disruption caused by Scotland leaving the United Kingdom - Alex would not want to scare the Scottish horses - but even by the standards of political rhetoric this is quite a claim. Here is how it might or might not work. We have explained before that an independent Scotland would have to rejoin the EU. For although Scotland is within the EU it is the UK that is the signatory to the Treaties - above the most recent UK signatory (Gordon Brown's) it clearly states "United Kingdom". (If in doubt see the definitive legal opinion supplied to the Scottish Government by Former EU legal Counsel Jean-Claude Piris here). So it is clear that an iScotland would have to join (not even re-join) the EU. So how long would that take? Gain an opt-out from the Euro + Schengen border controls: All EU accession negotiations are based on accepting the full treaties. In iScotland's case Alex Salmond will come to the table asking for a UK-style opt-out from the euro, justice and policing laws and Schengen and the a share of the current UK rebate. These are all in the main body of the treaties. Without them iScotland would have passport controls on the English border, have to comply with rules governing the eurozone and be signed up to a growing body of EU criminal laws. Some EU members will object or want something in return. Avoid a Spanish veto: Spain (and a number of other states listed in our table here) have an 'in principle' objection to secession. As Scotland would require their agreement to join this is a real problem, while not unsolvable has the potential to complicate matters. End negotiations with rUK: If Scotland were to opt to become independent it would enter into a long and fraught negotiation with rUK over the mountain of UK debt, assets, oil, currency, defence, passports and a whole range of other complicated issues. While this is going on the rUK will have want and be entitled to ensure that its negotiations with Scotland take precedence over iScotland's negotiations with the EU. The longer they stay out, the better for them. If they have the guts to implement free trade and low taxes they could be viable and free. No country in the EU has that. Those countries who are threatening to veto are laughable. One thing I still don't understand is why would someone want to join the EU. That's the biggest weakness in this idea of becoming independent. Why would Scotland want to swap Westminster for Brussels?! Truly laughable Salmond - what a typical liar of a politician. Brussels is even more interfering than Westminster and Scotland would never get powers back once handed over. Anything for a few more votes. And as I've explained before, ad nauseam, Cameron would prefer Scotland to make a seamless transition from being in the EU just as part of a member state to being in the EU as a new member state in its own sovereign right, and so not long after a "yes" vote he would probably be in Brussels, with Salmond in tow, trying to get the necessary changes to the EU treaties through Article 48 TEU on revision of the treaties. "2. The Government of any Member State, the European Parliament or the Commission may submit to the Council proposals for the amendment of the Treaties." Not the First Minister in the devolved government of part of a member state. The other governments might all agree to take Scotland along that Article 48 fast track to EU membership, but there can be no doubt that some would demand concessions such as Scotland pledging itself to join the euro; and it is entirely possible that at least one of them would refuse to allow Article 48 to be used and would insist that Scotland should apply to become a new member state through the normal Article 49 accession process, which would of course mean that Scotland spent some time outside the EU, and when it did join then like all new member states it would join with a binding legal obligation to adopt the euro at the earliest opportunity. Then the negotiations would have to centre on how to preserve uninterrupted and unimpeded trade between the EU member states, including the rest of the UK, and the new third country outside the EU, Scotland; and once again it is likely that concessions would be demanded in exchange for agreeing the new interim trade arrangements to apply while Scotland remained outside the EU. How does Salmond intend to join the EU after he has pushed Scotland into defaulting on its share of the UK debt burden (c. £120Bn)? The EU does not need another PIG as it has enough. Just to be clear, a refusal to pick up its share of UK debt is a DEFAULT. Who will lend to Scotland after this and at what rates of interest? No investor in their right mind would lend a bean. I have viewed Salmond bring down the tone of the debate on independence to its lowest common denominator and he has dismissed obvious major risks. If Scotland is prepared to default on its debt, or threaten to do so, then it won't give a monkeys about my two pensions that are sitting north of the border with two major Scottish asset managers and insurance companies. In a default it will just take my pensions. My pensions are already moving south back to England whether Scotland votes Yes or No. I honestly believe that Salmond has damaged Scotland. Dennis - Surely "Treaty Change" would trigger a referendum! Surely there would have to be an EU referendum in Scotland. The Scottish people should decide. And I mean people who are Scottish not foreign residents. Bugsy - I share your joke about Hague's so-called "referendum lock" law, which we have already found from experience would more correctly be described as the "referendum block" law. Anonymous - Salmond and the SNP have said nothing about asking the Scottish people whether they actually wanted Scotland to remain in the EU, let alone whether they wanted Scotland to become part of the eurozone. 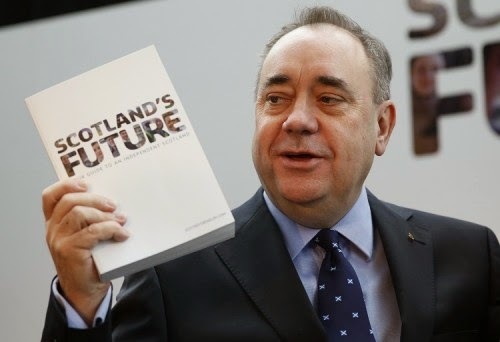 For the first I doubt that it would be possible to take negotiations with the EU to a conclusion and then get the outcome approved or rejected in a Scottish referendum on the kind of timescale that Salmond envisages; he wants to stay in the EU, and it would become a fait accompli. For the second, once Scotland had pledged itself to joining the euro as a condition for becoming a new member state of the EU that would have been decided and a separate referendum on the euro would be ineffective under the treaties and therefore pointless, as the Commission told the Poles some years ago when it was being mooted that there should be a referendum before Poland could join the euro, and as the Estonian government told the Estonian people to justify not putting euro membership to a separate referendum. The SNP point to Sweden where the government has been flouting its treaty obligation to adopt the euro, but no doubt others will have noticed that reference and would want to make quite sure that Scotland would not be able to follow suit by breaking its pledge. Given that Merkel has stated the goal that all EU member states should join the euro it is hard to believe that she would allow that to happen. At this stage it is about swing voters buying the thing or not. From there it can be said that Salmond has run a much better (and effective) campaign than the Stay In camp. Of course on the plain facts he is talking from the part of his body one usually sits on. The together campaign was simply from a PR perspective utter crap. The people you use as the faces of the campaign were a disaster from the beginning. If you get Brown on your side, the other side simply doesnot have to do much to get a good result. Communication to the swing voters was crap as well. They never got properly the point over that leaving the UK means leaving the EU and leaving the UK means a monetary limbo (among others). Lessons should be learned from this for the EU reneg. Otherwise a referendum is likely to end as another disaster. Hague as the face of a reneg rubbish. Osborne considerably more credible. But would be bad as the face of say NHS modernisation to be sold to say voters in the political middle. Farage. Would be over the top for this (He has an out image not a reneg one). Brown. Rubbish as his negative public image would confuse a lot of people. Cameron himself has also not the perfect image for this himself. Simply carries too much bagage from the past. Main points as well btw (both to the local voter as well to the restEU) pretty poorly communicated. Apparently >50% wants to keep the EU in now. But the correct question for say the white flag brigade is: do you want to keep the UK in or do you want to get them out AND pay several 100s Euro per garlic eating person per year for the cost thereof? Which is a totally different question. The real question should be communicated and the UK will probably have to take care of that. None of this makes any sense for anyone in Scotland wishing to have more control over their country. * Why swap Brussels for London? Far worse in terms of the restriction of freedom. * Why swap the Pound Sterling for the Euro? This is a currency that is only going to break it's participants unless a single country is formed from those participating in it and what chance Scottish freedom then? * Why go for independence in the first place because without English money and industry behind them, it won't take the Scots long to find out that their much vaunted social benefits require a properly functioning and cash generating economy, not just an ever diminishing pool of oil. My conclusion is that Salmond is like most politicians: he's full of blarney and short on truth. If the Scots are daft enough to believe him and vote Yes then I wish them well but fear the worst. Meanwhile, England would save a shed load of cash that would otherwise go north of the border and dispense with a small army of left wing Scottish politicians in Westminster. So, whilst the partriotic Average Englishman is keen to preserve the Union, he thinks it's the Scots who will have to worry about the outcome of the referendum far more than his own countrymen. Be careful laddies and laddesses or you'll awl be doooooomed! Also regarding the basic question of whether Scottish membership of the EU could be achieved in 18 months, I do not underestimate the desire of the EUSSR to put a further nail in the independence of the UK as a whole, so it may well be possible but at a price I doubt that the Average Scot would wish to pay in terms of a reduction in freedom, membership of the Euro, etc. It is hard to see imho how Scot independence will work out on Brexit/Referendum/reneg. You will get different trends that work in different directions and it is hard if not impossible to see how strong each of the trends will be. The politicians might get swamped. However the EU referendum thing is driven by popular demand. It will be nearly impossible for Cameron to come back on that (unless he is suicidal for his own career and his party). Scexit will make the rUK more Conservative and more likely to vote pro-Brexit. And as said this is electorate driven not driven by the political class or the government. Scexit will also confuse the 'enemy' (Brussels). Very likely alienate more people from traditional poltics. Here it will be either the group that will see the Scottish EU sort of exit as weird or the group that sees that bending all the rules is allowed if it serves a purpose as weird. Which one would be the greater disaster is hard to predict. How bad things will get financially/monetarilly will probably decide on that. Hard to see Cameron will be burning his national and European political capital to get a good EU deal for Scotland. That will be very hard to impossible to sell at home and he needs all the European capital he has for the reneg. So imho in case of a Scexit there will be several trends pointing in different directions. As however the strength of most trends is hard to predict/estimate the final result thereof for referendum/exit is nearly impossible to predict/estimate as well. Out of the frying pan and into the fire. Why in the world would Scotland want to join what is nothing more than a bigger socialist bloc? There are 2 sides to this conundrum, 1. it's never going to get past the Spanish and any other country with provinces waiting to flex their muscles.